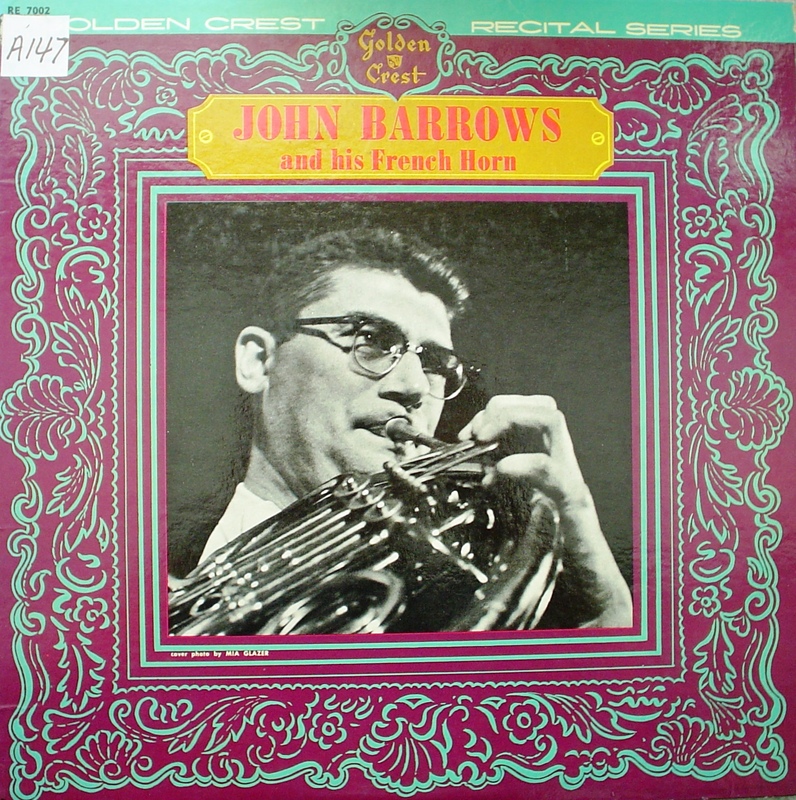 We have a number of classic horn recordings on LP in our music library, one of my favorites being John Barrows and His French Horn, recorded in 1960 (I think) by Golden Crest Records. To my knowledge this LP hasn’t been reissued on CD, although it really should be done. The album is devoted to the music of Alec Wilder, and includes the First Sonata, Second Sonata, and Suite for Horn and Piano, with Milton Kaye, pianist. These are great recordings, and as close to a definitive interpretation of Wilder’s music as you can probably get. Barrows was a longtime champion of Wilder’s compositions, and they held each other in high esteem. Included on the back of the LP is a written tribute by Wilder praising Barrows for his artistry. Though brief, these paragraphs candidly explain Wilder’s immense respect for Barrows and his horn playing. I’ve admired John Barrows since the day I met him all those years ago in the Eastman School. Intelligent, intuitive, witty, warm and a marvelous musician. My praise may sound suspect considering that it’s my music he has played so superbly on this record. But I swear that, had he never played a single note of mine, my respect would be the same. He is the bane of all French Horn players, not only because he plays so brilliantly, but because he seldom, if ever, practices. This, I recall, considerably startled me when, after a rather rocky night, he rose with the dawn, wandered up a side hill with (for some mysterious reason) his horn under his arm and let loose, for the first note of the day, a high concert F. For those of you who aren’t familiar with the instrument, this is the top note of the horn. The strong, intelligent, extremely sensitive playing of Milton Kaye is totally satisfying to me. And I feel that his extraordinary musical rapport with Mr. Barrows is not only constantly in evidence, but has made greater ease and fluidity possible for Mr. Barrows’ performance. The soloist, whose name escapes me, is obviously a technical marvel. But what Mr. Barrows cannot seem to comprehend is that the Russian’s capacity to produce subtle, mature, communicative playing is minimal in comparison. Up next…James Chambers plays the Ralph Hermann concerto. Do you believe the, “he seldom, if ever, practices”? Do you think it possible to play at a high level without putting in hours a day? I can almost see how you could be working on shaping the sound in your head before putting horn to lips, but I don’t see how you could have any endurance at all without regular daily workouts. I wondered about that comment as well, Lyle. I suppose the effortlessness with which Barrows played might have given the impression that he didn’t practice, but I’m sure he put in the time. Maybe he didn’t have to woodshed things as much as others, but from a purely calisthenic point of view you need put in regular practice to be able to make it through a recital, concert, etc. I have heard similar talk about James Stagliano – from several old schoolers – and have had similar doubts about it. It makes for a nice myth, but playing horn is a physical effort that requires regular exercise. For some players, this might be just a 20-minute routine, on top of a busy daily schedule of rehearsals and concerts. Barrows was an “in demand” player. I’ll bet he played a lot every day. This recording of Barrows was always one of my favorites. He played those pieces so beautifully and with such love. I wish they could be had on CD but I think they are not available. The one with Tom Bacon is nice too if you want to hear the pieces but he doesn’t sound quite like Barrows. Different concept of the music really, not a put down of Tom who is a great player. Barrows really owned these. @Lou Yes, these really are great recordings. I like Tom Bacon’s recordings, as well as David Jolley’s. Awesome! Thanks for the update, as well as all your hard work on the IHS website. Barrows did not practice much – sorry to disappoint you guys who thought this was all fiction. He did not warm up in the traditional sense either. Just picked up the horn and “got at it.” But he did play pretty much all day, everyday, except maybe a break on the weekends to go bowling, hang out with friends. He was so gracious to play the etudes that were assigned, then play them with you for a boost. And he would demo all sorts of pedagogical techniques during lessons. (I studied with him four years at the University of Wisconsin). I also was well grounded in natural horn and spent one full semester under his mentorship with the hand horn. And he could play natural horn as well or better than any current (alleged) virtuoso. HIs playing and performing schedule was staggering i.e. chamber music, the various performances, his touring in the UK and Europe with Serkin, his work with Casals, the New York Woodwind Quintet, then the quintet at the University of Wisconsin. He also did a series of recordings for the Library of Congress with the Julliard String Quartet. Few know about this and I wonder what happened to these recordings of rare and forgotten works for the horn in chamber music and solo settings. He also helped out with the Chicago Symphony and was quite fond of Dale Clevenger. He was a warm and gracious guy and had talent/pedagogical virtuosity that most current players simply would not believe. And he had a marvelous sense of humor. He loved the stunt of playing the Mendelssohn Violin Concerto on the horn as a gag. And he played it beautifully. He played his two old C.F. Schmidts, his Mirafone descant, and a few odds and ends until the Holton Company sent a new nickel silver Farkas model horn over to his studio from Elkhorn, Wisconsin. I was in his studio when this horn arrived. He fell in love with this Holton horn immediately. It was what we now call the model H-179. He eventually switched to the model H-177 in nickel for the smaller bell throat that was closer to his old Schmidts. This is anecdotal and conjecture, but I think Barrows had great influence on the Holton company and their horns and mouthpieces. He was able to help Carl Geyer in a number of ways as well. Carl reached the point where he could no longer bend brass, hence the Holton Company made a model of Geyer’s horn, the H-190. These are exquisite horns and few players even know they exist. And Carl helped to promote this horn at various shows. Barrows arranged for Carl and his wife to move to Madison, Wisconsin and become the instrument tech for the UW School of Music. But we could not get old Carl out of Chicago. His friendship with Alec Wilder was quite touching and Barrows helped Alec keep track of his finances, royalties etc. Wilder would often be seen on the music school annex steps reading Popular Science. He was a distinguished guy and always wearing a sport coat and tie. It was a thrill to have him compose a work for our freshmen horn quartet. And of course we took him out for pizza and beer. I don’t think he was a fan of either, but was so gracious to indulge us. What a joy it was to be mentored into hornplaying by John Barrows, arguably one of the all time greatest virtuosos of the instrument. And of the natural horn. Thanks so much for these reminiscences! May I repost them in a separate article on this website? I think readers would really enjoy them. I was a student of John Barrows from 1961-1965 at UW Madison. Manuscripts are still at the UW. Also, have any of the Barrows recordings been reissued on CD’s? I’m searching for his recordings of the Wilder Sonatas accompanied by his wife Tate Sanford Barrows. It’s nice to hear from another UW grad! The Wilder trio manuscripts sound like a real gem. Do you know if anyone has published them? As for the Barrows recordings of the Wilder sonatas, I don’t think they have been reissued on CD, but you might be able to track down a used LP and transfer it to digital. It’s a pretty easy process, and the quality is good. I heard that Steve Ovitsky of Sotone recordings down in Santa Fe was trying to get the copyright lifted so he could record the Wilder Sonata LP onto CD disc. He did get the Quintet for horn and strings, Mozart K 407, and the Brahms Horn Trio transferred to CD’s. My years with Barrows were from 1963 to 1967. We should have known each other, but I was not a grad student. I sort of recall you and we were fortunate to have been at the UW in those years. Ah……………..you were lead horn in the concert band under Ray Dvorak as I recall. Am I right??? My best to you Tom and stay in good health – that seems to be the big challenge for guys in our age bracket. Dave in Colorado Springs – still playing but strictly as a recitalist on natural horn and double horn. I was at Madison from 1961-1966. I had a double major in Organ/French Horn. Although I still have a church position, my horn went into “retirement” many years ago. The 8D went to a young lady who was going to Juilliard for her performer’s certificate. and Vance Nelson. I have the recording that has been reissued. W\It would ould be great to have the one with the Wilder Sonatas. Hi Dave, thanks for promoting my arrangement! Would love a copy of the program if you can get your hands on one. Hope your recovery is going well. I was a horn/organ major at UW/Madison and played horn in the concert band from 1961-1966. I was first horn from 1964 – 1966 I will always remember Ray Dvorak’s comment: “He’s not a horn major, but the best we’ve got!”. James, I will email Abe Minzer, host of the SALON series where the Meditation was played several weeks ago. Also I may be getting a DVD of the program. The horn jock is Mike Yopp, the gold standard of horn artists here in Colorado. We have three guys who really stand out to include Mike. These guys are Mike Thornton, lead in the Colorado Orchestra/horn studio at CU Boulder, Michael Yopp, lead in CS Phil and Boulder Phil, and Matt Scheffelman, lead in the Colorado Opera/Ballet and number one free lance horn jock in Colorado. These guys play so well it is beyond my comprehension. Any of the three could hold down Chicago or NY Phil in a heart beat. My favorite is Matt and his playing is ethereal. But Mike Yopp is the real champ because he does it all on the horn, and has his own computer IT biz here in Colorado Springs (with four employees on the payroll). As Mike says, his day never ends between the demands of the business and all the playing he does. Mike Yopp is a classic Chicago trained player and did his horn studies with Gail Williams. Mike is known to do crazy stuff like back to back Strauss Number Two’s with orchestra. Heck, most people can barely make it through that tune in their basement. We have an army of ROCK STARS on horn out here and very competitive – two National Horn Competition winners right here in Colorado Springs. I steer clear of the younger guys/gals, but they are my friends and sort of look up to me. I am referred to as the “Godfather of the horn.” Ha ha. Scary title. Dave P.S. Ooops I forgot that the program is on an email the Abe sends out for his Classically Alive Series. So let me search for that and send it down to you provided I can find it.